E-mail me or contact me through one of the links below to discuss your project, or if you would like more information on my services. You can contact me through one of the links below if it is not business-related. I have been dreaming up theme parks as long as I remember. I grew up going to Walt Disney World about once a year, and it captivated me so much that I started sketching ideas for theme parks of my own. Initially, these ideas were theme parks to be built in my home state, West Virginia. But throughout the years, I thought of many ideas for parks not specifically for West Virginia. Interspersed throughout the many theme park ideas, I also thought of stories that could be for movies and other media. In reality, all of these ideas are about creating worlds of your own that you can tell through a story. After getting side-tracked by life and into other fields of art, I finally decided to pursue my dreams and move out to California back in 1998. 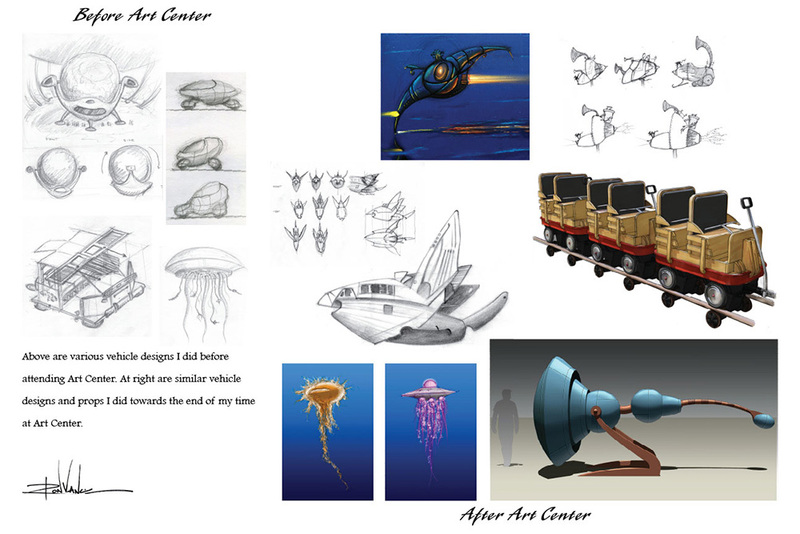 I started doing a some freelance in theme park design, but it soon became obvious that I was going to have to improve my design drawing skills if I was going to develop this into a career. I started taking night classes and eventually decided to jump into school full-time. I was accepted into Art Center in fall 2003, and I graduated spring 2009. It took awhile because I switched majors (from Product Design to Entertainment Design) and I took a few semesters off for an internship. After graduating, I returned to Thinkwell (where I had done the internship for two semesters) and worked there for two years. This was a great place to get my feet wet and hone my skills, and since then I've worked for a variety of other places, including a long-term stint at Walt Disney Imagineering, fulfilling a dream I'd had since I was a child to work in the dream factory started by Walt Disney. 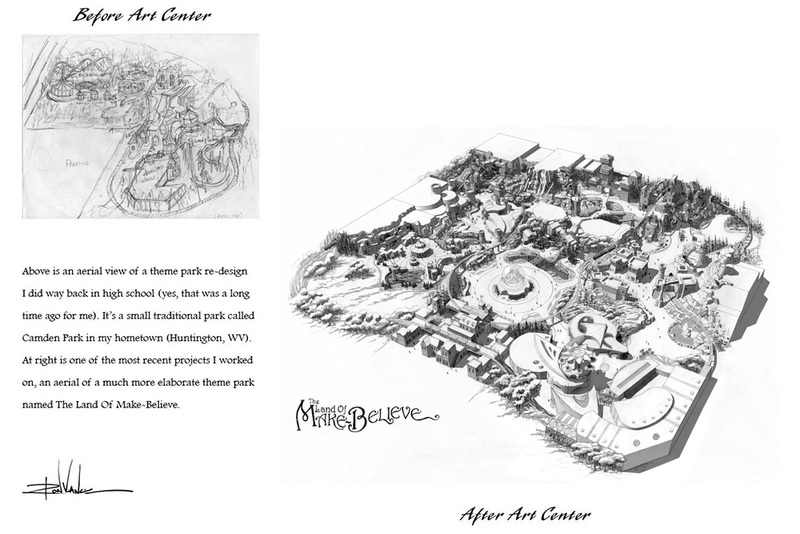 About a year after I moved to California in 1998, I started pursuing freelance in theme park design. I was getting jobs sporadically, but looking around at the artwork out there, I knew that I needed to improve my drawing skills in that field. I found a class at Art Center called Theme Park Design taught by Orrin Shively that intrigued me, so I took that class early 2002. I loved the class, but when it was over I knew I still needed to work on my design drawing skills. A friend of mine sent me a link to Feng Zhu's website and I noticed he was teaching classes at Gnomon. I took both classes in the summer of 2002. 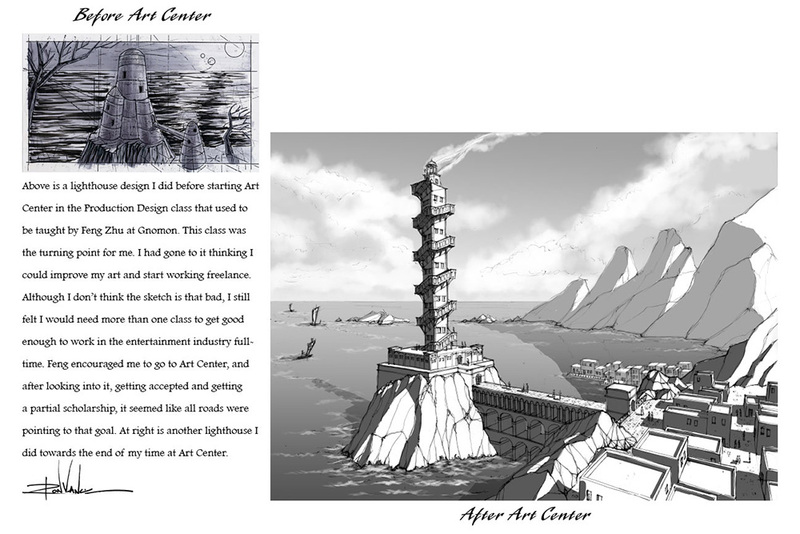 Feng talked about Art Center and how it would help you become a better artist quickly, due to how much work they would throw at you in a short period of time. He encouraged anyone interested in pursuing a career in Entertainment Design to go there if they could. I decided that was what I needed to do. Feng Zhu suggested that I take Product Design at Art Center, so the next class I took was oriented towards putting together a portfolio for that—Intro to Product Design in the Art Center at Night program. It was specifically oriented towards people trying to get into the Product Design program. I took this class in the fall of 2002 and it helped me put together the majority of the work I put in my Art Center portfolio. 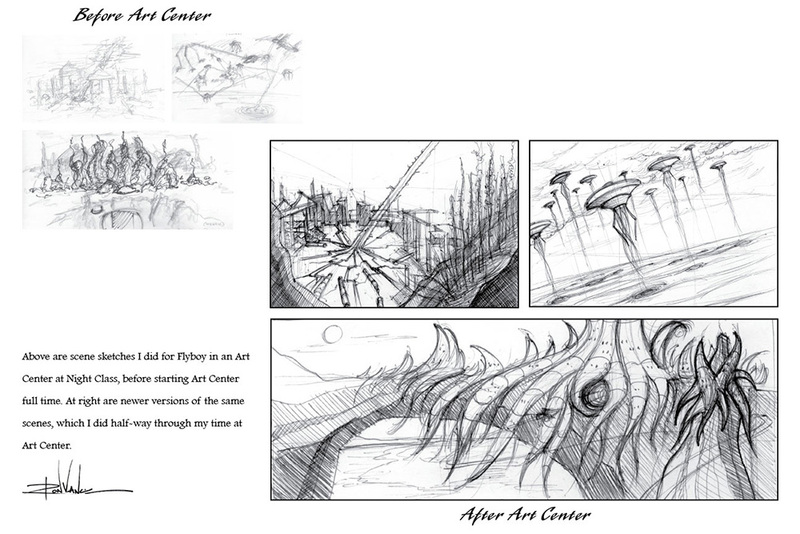 Below is a link to the portfolio that I gave to Art Center that helped get me accepted. In addition to this, I included a recent sketchbook. I was awarded a small scholarship, an honor indeed. I'm showing this to give you ideas on how to put together your own portfolio, not as an instructional, step-by-step how-to. Just use it for inspiration. 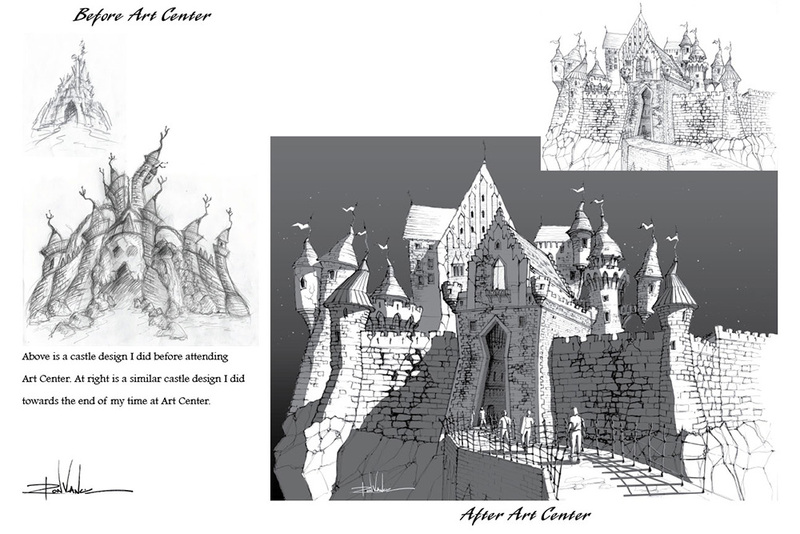 Below are some examples of artwork I did before and after Art Center. 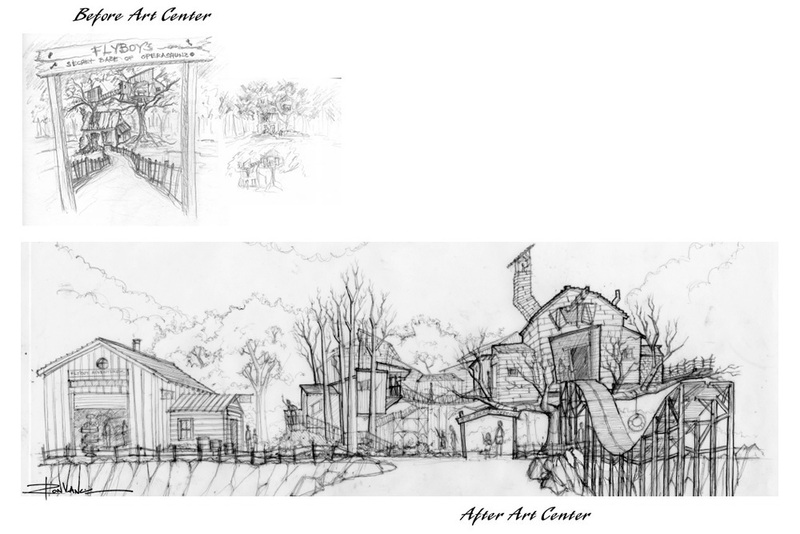 I tried to find similar images, or, when available, old sketches I had re-drawn, to show the difference that a few years of Art Center can make. But be warned—it's not easy to spend a few years at Art Center. 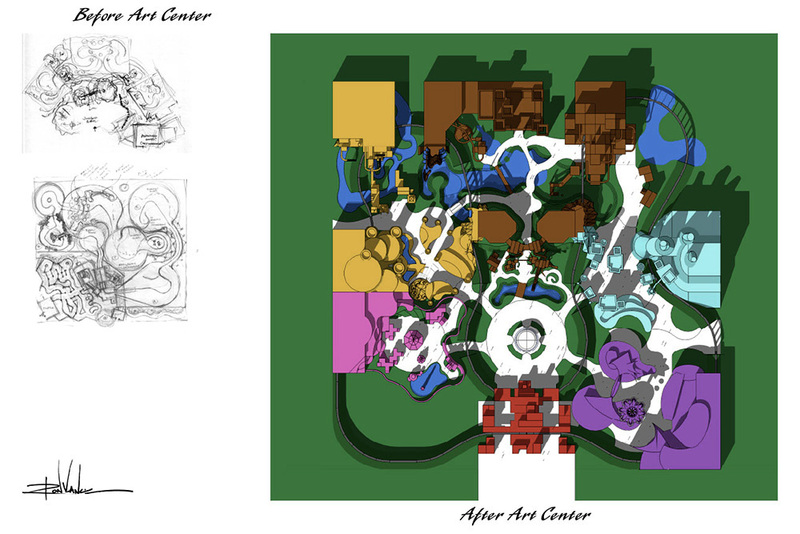 There's a reason I called it Art Center Bootcamp—I was tempted to call it Art Center Hell, because at times it is. You won't have a social life, you'll go through many days on less than four hours of sleep (if any at all), and your health will probably suffer. But at the end of it all, you will most likely look back at what you did before and be amazed at how much better you are as an artist. I find looking at these "before and afters" helps make it more worth it, and hope they will come as inspiration to those of you out there who may be considering going to school for a career in art as well. Oh, and it's never too late! I gave up a decent career (but one that was going nowhere) to go back to school and have never regretted that decision. It was kind of scary, but as Walt Disney said, "It's kind of fun to do the impossible!" © 2014 Ron Vance  Pasadena, CA, USA, unless indicated otherwise. All Rights Reserved. No reproduction of any kind permitted without prior written consent.